On the subject of invisibility. As I have noted elsewhere, my long term project on Hamilton’s streets is trying to make the “invisible”, “visible”, to put a spotlight on those people who live or eke out an existence on the streets and whose very presence is so common as to render them invisible to the gaze of passers-by either by accident or design. I am adding two photographs to this blog entry—one in colour by a photographer from the Hamilton Spectator and a black and white image by me, both of which share, in part, the same subject, a person in the images, as you will see. The caption to the colour image was “Pedestrian walking in the blowing snow Tuesday morning”. Which begs the question, which person is referred to? The caption alludes to a single pedestrian. It seems to me that the viewer would be drawn to the person in the background who is demonstrably walking. The bloke with the sign, as anyone who actually looks at people in his situation will readily attest, is unlikely to be “walking” anywhere. Standing, most likely. What then is the effect of the image and the attendant caption? Ironically, the camera has drawn our attention to someone who, because of the depth of field, is out of focus, while the person in the foreground is sharply captured but rendered “invisible”. Now, I and the Spectator’s photographer covered such the same ground that day. I came across the bloke in the picture later on I think. When I saw him on the other side of the road, he was fielding what seemed to me to be a stream of abuse from two blokes just ahead of me who were clearly also in the street community . They walked on, and I crossed over. He told me his name was Kiefer, and I asked if the other two had been giving him a hard time. He gave a rueful half-smile. “No”, he said, ‘one of them was my older brother”. 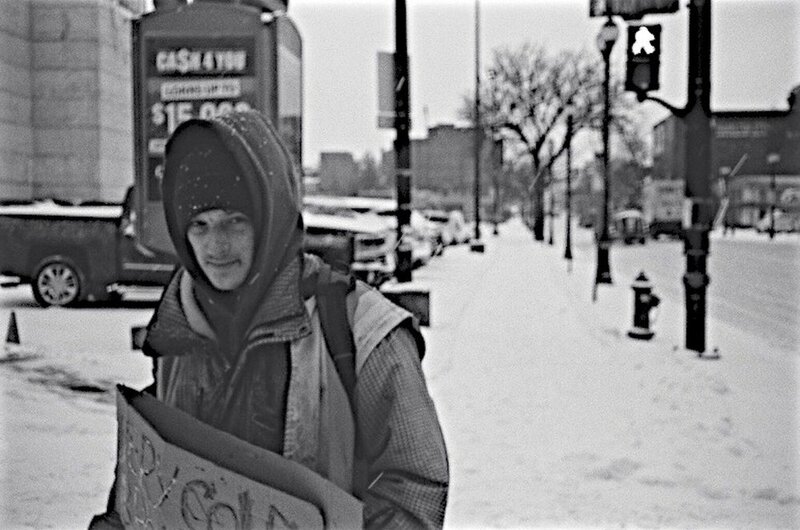 It was a miserable day and of course snow in the city provides local interest, but the real story to my mind was the fact that not only was a young homeless guy reduced to begging on the street, but that he was part of a family for whom the street is their home. How sad that the weather was the subject of the story, rather than people who had no shelter from it. And how ironic that a camera together with a caption can erase, to all intents and purposes, the larger significance of the image. I received a newsletter yestrday from WorldStreetPhotography.com containng the following piece written ( I use the term loosely) by one Michael Ernest Sweet who had just undergone what must have been, judging by his language, a torturous experience in curating a photo competition. My first impression was, the bloke must have been having a bad day. Then I looked a bit closer at what he was writing and followed that up by looking at some of his own work. Disclaimer / confession. 1) Prior to doing this I had no idea who he was. 2) I have photogrsphs on the site, but not in the competition to which he refers. Michael Ernest Sweet: First, allow me to begin with a bit of a rant. I’ve said it before, and I will say it again, there is too much repetition in street photography. Go out, photographer, and push the boundaries, break the rules and capture something different! If I ever see another street photo of a young woman on a cell phone, someone with an umbrella, or a failed attempt at irony by aligning a person in front of a billboard, it will be much too soon. This stuff is dead. Stop making what you think a street photo should be and just make photographs - work from the gut, not the head. What struck me about his rant—and this is not all of it—is that for someone who had been given the honour of curating a competition, he seemed extraordinarliy frustrated not to say bitter. Hence my reason for looking up some of his work. Now, note his comment about the young woman on a cell phone. On the cover of one of his books – he has published two—there is, you guessed it, a photograph of a woman on a cell phone. Well, ok. So that was maybe a one-off. But no. It gets worse. You notice how he is sick of umbrellas. Well, lo and behold, on the very same website that bestowed upon him the responsibility for judging a street photography competition, I found that he had also run a competion in the past. You’ll never guess what the subject was. Or maybe by now you will. Of course, it was nothing other than umbrellas. With this I mind, his exhortations to “capture something new” rings just a tad hollow wouldn’t you say. Of course, someone with such an exhalted opinion of himself would not be seen on the net wthout a photograph, and a photograph of said Sweet is there. He smiles his self-satisfied smile from beneath a jauntily tilted fedora much in the way of the late Tom Wolfe. Needless to say, the photograph is taken indoors. What self-respecting “artist” would not have a photo taken indoors without wearing a hat. And of course he has a few days unshaven growth to boot. “Break the rules and capture something different”? Photographer shoot thyself, to paraphrase. And while on the subject of originality, his other book is a series of shots at Coney Island. Now there is an original thought. How many people in the past hundred years have done that? I remember reading an account of someone who had participated in a Bruce Gilden workshop and had been mightily abused verbally by the great man for his feeble attempts at street photography. Some people are masochists and that bloke enjoyed forking over the price of a camera to be embarrassed and humiliated. Each to his own. It seems to me, that Mr. Sweet who, it turns out, now lives in New York is trying in some way to emulate the personna of the grumpy genius. Grumpy he may be, but the ranks of the world’s geniuses will not soon part to admit him I venture to say. Martin Parr has praised the work of Sweet. I “tips me lid” to Parr whose position as president of Magnum speaks for itself. I can only say that had Sweet an ounce of the class that Martin Parr possesses, he might have decided against writing a peurile, self-centred piece of pomposity. His own website has one of those awful third person bio’s that are obviously self-authored. You can get a measure of his self importance by his refrence to two Canadian awards—neither of which are for photography—The Queen’s Silver Jubilee medal and The Prime Minister’s award for education. The ever humble Mr. Sweet allows as to how they are two of the most distnguished awards for civilians in Canada. Nothing like taking hyperbole to the absurdo ad reductio is there? No less than 60,000 people in Canada received the Jubilee medal and the people who have received the Prime Ministers’ award number in the thousands also. This is not to denigrate the awards, but his description, ironically, lessens their value while attempting to increase his own. In his case a Sysephean endeavour no doubt. I find his comment, “Stop making what you think a street photo should be” to be the height of – there is only one word – hypocrisy given that he has done nothing but tell people what street photography is not in his exalted position, and by extension and implication preecisely what it is. I suppose my argument could be countered by saying that anyone who was discouraged from taking street photographs as a result of Sweet’s hissy fit should probably not be trying anyway. That approach gives more credence to Sweet’s mean-spirited attitude than it deserves. For someone who boasts of his award for education, his is a curious attitude. From what I have seen I can only endorse that sentiment and hope that it holds true for a long time to come. I made my feelings clear in my last blog post about Amazon and the price of Acros 100. Today, I was looking to see how much a roll of JCH 400 Street Pan would cost. This is a good film, and I used it in China last year. I first went to Japan Camera Hunter (from which company the film derives its name) and saw that I could buy five rolls for roughly the equivalent of $45.00 Canadian. Out of interest, I went to Amazon Canada, and discovered, not altogether surprisingly, that a single roll would cost over $50.00. I wrote to the supplier enquiring how such a rip-off could be justified. The mealy-mouthed response was that Amazon automatically increases prices if the suppliers are few or if the demand is high. Given my belief in the free market economy I have no problem with the economics of supply and demand, but this to my mind is manipulation and profiteering. The supply is only short on Amazon. My advice to anyone wanting to avail themselves of this film -- it is the child of Japan Camera Hunter's owner, Bellamy, -- is contact JCH directly and give these profiteering bludgers on Amazon a kick in the wallet. This kind of rip-off makes me want to chunder. Word from Fujifilm, although not yet official, is that next year Acros 100 is to be discontinued. This is sad for a number of reasons which I will expand upon. The film is an excellent product and excels in its lack of reciprocity failure. If anyone wants to see what can be done with the film, take a look at Ted Vieiria's work--you can see it on Instagram, on You Tube and Facebook as well as his own website. You can also look at my own if you have nothing better to do. This is a film that has no equal in its niche, but Fujifilm is, reportedly, going to discontinue it. Why? I guess the main main reason is profit or lack of it. Now, don't jump to a conclusion. I am not a "progressive" who considers corporations evil or that profit is the root of all evil. I understand the importance of the market and I believe in the laws of supply and demand; I also understand that a corporation needs to make a profit to continue in business. But is Fuji losing money on Acros? Who knows? They haven't said. Were they to have given some explanation as to their decision, it might be more palatable, but to my mind they are treating loyal customers with contempt by remaining silent. I reiterate. I agree that profit is necessary. The question then becomes at what point is profit unprofitable? Get your head around that one for a moment. Using Micawber economics, an excess of income over expenditure equals liquidity. An excess of profit becomes greed. And that leads to the next point. As yet , I don't own a scanner so when I have developed my film I take it to my local camera shop which then scans the negatives for me, and a bloody good job they do as well. They also stock a variety of film including, you guessed it, Acros 100. Yesterday when I went to get my latest roll of film scanned, I bought some more rolls, declining the bloke's behind the counter suggestion to "buy a few hundred". I like his humour. When I got home, I thought I would check out the market and went to Amazon.ca to see what price they were selling Acros 100 for. Their price was more than twice what I had paid. I sent them an email questioning their profiteering and got back a weasly response. If you want to get Acros at a reasonable price let me know. I'll put you in contact with my local store. Avoid Amazon for this. They are trying to gouge the vulnerable. Now back to Fuji Film. I now know the world has gone mad. At the same time that they are discontinuing Acros 100, they continue to produce a line of digital cameras that emulate the product of the film that they are, reportedly, going to can. The end result presumably: A bunch of guys in skinny jeans who grow beards, spending thousands of dollars on cameras to produce a "look" that they have never seen in the original. My exhortation to the legions of the hipsters who are likely to bankrupt themselves in pursuit of an "original" look. Save yourself the trouble. Get a film camera and a roll Acros 100 while it is still available and learn to make real photographs. I'm a big fan of "Footy", Aussie Rules football, but living in Ontario means that I have about four and a half months' maximum (if the Wildcats make the post-season) shooting time. I fill in with rugby after that as much as I can, but that still leaves a lot of time with no footy of any kind. So, I shoot indoor sports and have managed to get accreditation for the local uni which is my alma mater as well. When I started shooting sports, I did what a lot of people do. I Googled the hell out of the subject and learned what I could. And this was quite valuable, but it comes with a caveat. Consider the source. There is all kinds of advice on the internet, but a considerable amount of it is not original. That is a nice way of saying some bludger or other has taken somebody else's words and rewritten them. In school that is called plagiarism and it should be rated as a capital offence as far as I'm concerned. You might see a website that promises the open sesame for sports shooting. You read the advice, absorbing every detail and then read the "writer's" bio only to find out that he or she is a "lifestyle" photographer or has some experience in the world of fashion. What in the Sam Hill do these people really know about sports shooting? You don't need me to provide an answer to that question. My advice is to go to You Tube, do a search on sports photography and check out some of the people there. I'll save you the trouble. Look for Quinn Rooney and anything he has there. Look at his stuff over and over and over. Hear it from the horse's mouth, so to speak, and save yourself the trouble of reading something plagiarised that comes from a horse's arse. And just in case you're wondering, I don't know Quinn Rooney; I wish I did. His sports shots are an education. Once in a while I look at Eric Kim's photography. I don't particularly like it, but that doesn't mean I can't learn something from it. However, there is something he said in an interview that, to my mind, deserves a response. Talking about his entry into "street photography", he said, "Taking that to the street, I was fascinated taking photographs of strangers (gasp) without their permission!" This relates back to my earlier criticism of the search for the "decisive moment". Is there something about so-called "Hipsters" that causes them to get off on "candid" shots? There is nothing, I would argue, particularly valuable about shoving a camera in someone's face, taking them by surprise and publishing the result. Is the fact that permission is not requested a sign of victory for the person taking the shot--a sort of "look how clever I am"? That's how it comes across to me and I detest it. I ask people, unless it is at a demonstration in which case the shots fall under the rubric of photojournalism, if I can take their picture. In most cases the people I photograph are in society's margins, and they have little but their dignity. I respect that and to take their photo without permission would make me feel dirty. See the introduction to my site where I refer to Don McCullin. Again, anyone who wants to "do street photography" should view his video. Henri Cartier-Besson spoke about "the decisive moment", and ever since then legions of "street photographers" have been trying to replicate what he was talking about. The problem, of course, is that there are legions of Cartier-Bessoin "wannabes" roaming the streets shooting "candids" and feeling proud of themselves. Even worse, people are holding workshops to "teach" people how to shoot "on the street". A pox on all of them. There is nothing to celebrate in photographs that cause other people to feel superior to the subject or cause the photographer to feel "clever". My advice to anyone who wishes to shoot people on the street is to view Don McCullin photographing in Whitechapel. That is worth far more than dropping cloise to three thousand dollars on a "workshop"
Reports of film's demise are decidedly premature, if not simply fantastical. It seems especially ironical to me that so much effort is put into the ability of software to emulate the look of film when all anyone has to do is get a film camera and start shooting with it. I have been silent for a while, due to a severe case of Shingles. If you are eligible for the vaccination, go and get it. If this affliction had a more alarming sounding name I might have done what I am advising you to do. But "Shingles" conjures up benign images of beaches in England--to me anyway. The reality is far from that. I feel as if someone has been going over me with a wire brush. The result has been that it is painful even to carry a camera bag. That said, I feel a minor improvement each day and I am slowly getting some photographs to post. The latest couple are on my Hamilton page. For a while, I was zealously committed to "straight out of the camera shots", believing that anything else was "cheating". Then, when I explored the greats of photography--and I mention in particular Don McCullin--I discovered that they all touched up their negatives in one way or the other. I now see that "processing" in Lightroom, Photoshop et al is simply the digital world's equivalent of the darkroom's Indian ink. I refrain from changing photographs to the extent that they look--and I borrow from Don McCullin here-- like chocolate box decorations. Nevertheless, when I can I shoot in film anyway and make such changes as necessary to contrast digitally. Having just got my web-site up and running, I decided that I would periodically "blog" too. By and large my comments will accompany the photographs that will populate this site, but if something seems to me worthwhile mentioning then I will, well, mention it. There are some subjects that are so sterile as to drive a person incontinent with frustration--the debate of film vs digital which is a stultifying as the raucous exchanges I remember from my military days over which branch of the service was better. Consequently I won't be touching the D vs F topic here. The same goes for types of film or methods of developing. There are fora for those who wish to indulge themselves on those topics, and my advice to them is go there, fill your boots as we used to say. This blog will be forever silent on the subjects. You may deduce from this, then, that the blog entries might well be sporadic, and you are probably correct. As I said, though, I shall post if something strikes me as worthwhile. If, by chance, anyone should come across this site and feel the urge to comment, I encourage you to do so although you will appreciate, if you have read my "About" section, that I won't be holding my breath.